Last week, one of the members of my church stopped and took this picture. It hasn’t been altered at all! No photoshop. Nothing. It made me wonder—is God trying to tell us something? I mean, it's right over our church building! Rather than allow my imagination to take over or to assume I remembered exactly what God had already said, I went back to His Word. I'm going to stand on His promises. 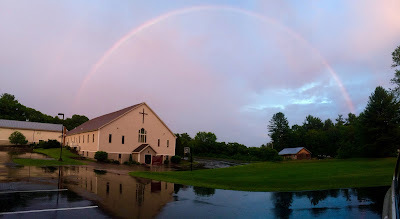 And when I see a rainbow in the sky, I will know that God is thinking of us, remembering His promise to us. And I’ll remember that I have an awesome Father who loves us enough to make so many amazing promises to us … and keep them.